I can’t believe November is around the corner. It’s finally not a hundred and five degrees. I was able to sit outside without the fear of melting. The stores ahead of the game as always have already all the Christmas things out, but the best thing is that it’s Nanowrimo time! For those who don’t know what Nanowrimo is, it’s the National Novel Writing Month. It’s where thousands of writers abandon themselves into the crazy challenge of writing a novel of 50,000 words or more in just the month of November. 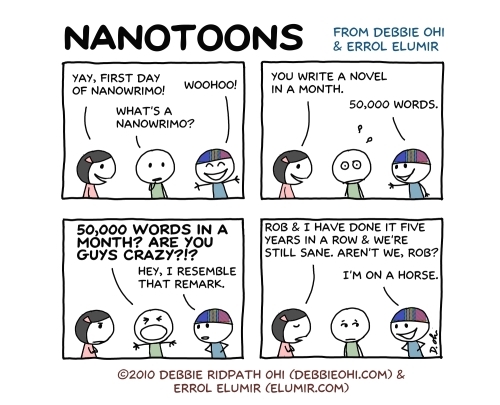 This will be my third year doing Nano, but different that my prior years, I have no clue of what I will be writing about. 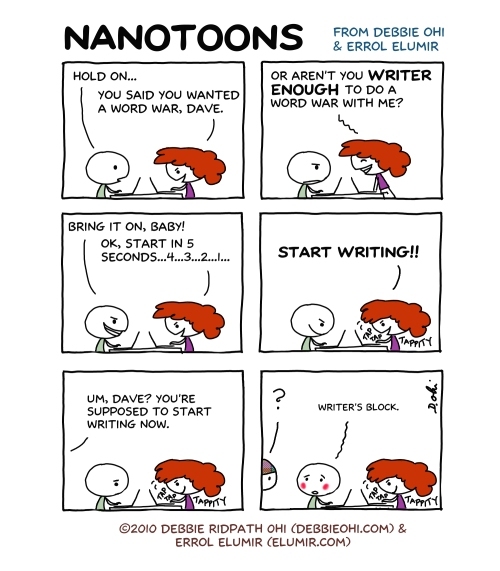 Us Wrimos (Nano writers) are doing all sorts of preparations at this time. This is our Super bowl, our All Star Game, the moment we wait for all year long. Wrimos are starting to pre-cook meals for their starving families, taking pictures of themselves as that’s all their families are going to see, blocking their calendars from other social events other than our write-ins (meetings of wrimos to write in public places)and buying extra underwear as there will be no time for laundry during the month of November. We will only stop for two hours on Thanksgiving because we need to be thankful to God for our lives, our muse and the turkey and then back to writing. Do I have many wrimos out there? Do you have a plan set in place? I would love to hear from you. Same to you! It’s not that hard. I was very scared on my first year and now I look forward to it every year. I’m in — for the first time. I only have a vague idea for a novel. I’m thinking this will be the year i learn by failing! Good luck!